Digital Thermometer Pan | OhGizmo! I do a lot of cooking for myself and others. And I always make sure foods like red meat are cooked fully so that there’s no chance of anyone getting sick from the food. But there can be some trial and error in making sure things are well cooked but not overcooked. 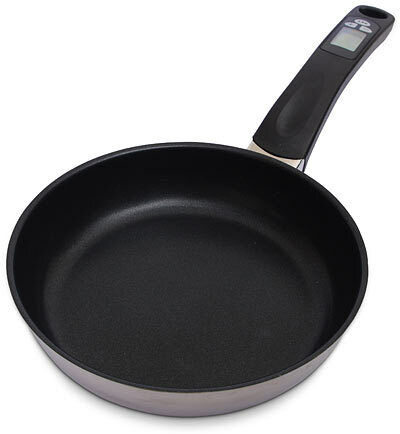 This skillet takes away the guess work for temperature by sticking a thermometer inside the pan. With a digital display on the pan handle you will always know what temperature the pan is at, with or without food in the pan. This means that those cooking instructions will be a lot easier and it will help prevent you from overcooking meals, meaning happier family/guests.